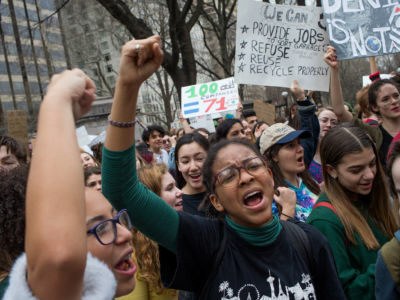 Students gather in front of the Museum of Natural History to protest the lack of action on global warming and other climate related issues on March 15, 2019, in New York City. It’s a time when the industrialization of western settler-colonial culture has geo-engineered the planet to the brink of extinction of even its own species. It’s a time when most federal governments are continuing along with a business-as-usual economic model — the same model that is literally killing life on Earth and rendering the planet unlivable. It’s a time when this global crisis fails to be consistently reported on with the veracity and urgency it demands. And it’s a time when children have taken it upon themselves to do whatever they can to bring awareness to the issue, and plead for adults — any adults, somewhere — to begin to behave responsibly and take the requisite action. Even the thought of these kids taking this issue into their hearts, and walking out of classes, and carrying out protests around the world brings inevitable tears to my eyes. As a longtime climate reporter, my sadness around this issue is now combined with a deep drive to do everything in my power to walk alongside these children, and support them, and contribute what I can during this ever-worsening crisis. There is no getting around it: The crisis is indeed worsening. This climate dispatch, like all those I have written before it, is a pulling-back of the curtain of denial that obfuscates our ability to behave with the urgency this planetary moment demands. It is simultaneously a survey of the last 30 days of the unraveling of the biosphere, alongside with the ridiculously inadequate human response to the crisis. A recently published study in the journal BioScience proves what many of us have known for years: The International Panel on Climate Change (IPCC) is underselling the climate crisis. The study shows that the IPCC’s language uses about the climate crisis is overly conservative, meaning that the threats we face are much greater than their reports suggest. Meanwhile, marine heatwaves are now sweeping the oceans “like wildfires,” according to scientists. Their study, published in Nature Climate Change, showed the number of marine heatwave days has increased 50 percent in the 30 years leading up to 2016, compared to the period of 1925 to 1954. This is grim news, given how much humans rely on the oceans for heat, oxygen production, food, and the sequestration of atmospheric CO2. This is on top of the fact that the last several years in a row have each been a record warm year for Earth’s oceans. Meanwhile, February saw a record monthly high for atmospheric CO2 levels (which typically peak in May), and last year’s greenhouse gas emissions were at an all-time high. And in a dramatic sign of how far along we are in the climate crisis, rain is now melting the Greenland Ice Sheet even during the winter. The drastic impacts of climate disruption are no longer a phenomenon of the future. On the African continent, starvation is already rampant in many places where drought has taken out as much as 90 percent of people’s animal herds and several countries already have half of their children living while chronically malnourished. In Italy, scientists have shown how extreme weather events driven by climate disruption have caused a 57 percent drop in olive harvests, causing that country to be dependent upon imports in April to bridge the gap. Across the US West, iconic forests of Ponderosa pine and Douglas fir are struggling to regrow after having been ravaged by wildfires, increasing temperatures, droughts, and consistently drier soil and air. Earth’s support systems are so stretched already that widespread species extinctions are now practically inevitable. Concurrently, a recently published report of a three-year UN-backed study has revealed extremely grim implications for humans, showing that the rapid decline of the natural world could well be an even worse crisis than the impacts of climate disruption. The hundreds of scientists who produced the report warned of how nature is in freefall and Earth’s support systems are so stretched already that widespread species extinctions are now practically inevitable. The report warns that the over-exploitation of seas, chopping down of forests, soil destruction, and pollution of Earth’s air and water are all driving life on Earth to the brink. The study, scheduled for publication in May, warns starkly that nature’s ability to provide food and water to an ever-growing human population is already compromised in literally every region of the planet. A recent report warned that, based on an extensive study, sea level rise impacts on California could be worse than the damage caused by earthquakes and wildfires by the end of this century. The study showed that even a modest amount of sea level rise will impact more than half a million people there, and cost the state 6 percent of its budget. Meanwhile, historic flooding recently hit the Midwest, as nearly half the counties in Minnesota flooded. Losses from crops and cattle in Nebraska alone totaled nearly $1 billion. Farmers across the region, already struggling amid drought and depleted soils, have been welcomed into a new crisis. For many of them, freezing floodwaters and the death of vast numbers of livestock will make their livelihood untenable. The oceans continue to acidify, as they are absorbing ever-increasing amounts of CO2 in the atmosphere. (They have already absorbed 40 percent of what has been emitted since the industrial revolution began.) The long-awaited outcome of shells of organisms dissolving has come to pass with wild sea butterflies. As the oceans continue to acidify, mollusk and crustaceans’ shells are in many cases being, literally, dissolved. The small snails, which exist in the colder waters of the Gulf of Alaska and other areas of that region, is set to become yet another casualty of climate disruption. Meanwhile, as drought continues as a largely chronic issue across many US Western states, seven of those states are struggling to come up with plans to share water from the Colorado River, which is the primary water source for at least 40 million people. And clearly lack of water is an issue that extends far beyond the US. A recent report warned that England could run short of water within just 25 years. The chief executive of that country’s Environmental Agency is urging people to cut their water use by at least one-third, to buy some time in order to figure out how to cope with the crisis. In another sign of the times, rapidly melting and retreating glaciers in the highest portions of the Himalaya are offering up the bodies of long-dead mountaineers. While it used to be a given in the mountaineering world that if someone died climbing the highest peaks on Earth and their body could not be recovered, it would remain there in perpetuity. Not anymore. Amid a record-breaking heat wave that brought the hottest beginning to a March on record for the southern third of Australia, firefighters fought 25 wildfires across Victoria. Winter wheat crops, wool and cattle herds have all been decimated by ongoing record-high temperatures, wildfires and drought across broad swaths of the country. Australia as a whole saw its hottest January on record. The Canadian province of British Columbia recently decided to boost its 2019 wildfire-fighting budget by nearly 60 percent, as dry conditions persist there after 2018’s wildfire season burned more than 13,000 square kilometers. 2018 was a record year for area burned in that province, which beat the previous record year, which was 2017. A recent report brought more grim news to the Arctic, showing that even if the world manages to cut greenhouse gas emissions in accordance with the Paris climate agreements, temperature increases of between 3 and 5 degrees Celsius are already locked in for the Arctic. Even if the world manages to cut greenhouse gas emissions in accordance with the Paris climate agreements, temperature increases of between 3 and 5C are already locked in. Such temperatures will accelerate the already thawing permafrost, melting summer sea ice and potentially release subsea methane deposits that could release catastrophic levels of methane into the atmosphere. Roughly half of the permafrost in the Arctic will thaw even if the world keeps emissions in line with the Paris agreements. This thawing will release even more CO2 into the atmosphere since the permafrost holds vast stores of organic carbon. Across the US, another study revealed that over the last two decades, record high temperatures have been outpacing record low temperatures at a rate of two to one. In Canada, mid-March saw at least 32 high temperature records across British Columbia smashed as a heat wave rolled across the region. In Africa, millions of people were impacted by a devastating cyclone that the UN said could well be ranked as one of the worst weather-related disasters to ever strike the southern hemisphere. Cyclone Idai slammed into Mozambique, then Zimbabwe and Malawi, leaving nearly 3 million people in need of aid. “This is the worst humanitarian crisis in Mozambique’s history,” Jamie LeSueur, who is leading rescue efforts in Beira for the International Federation of Red Cross and Red Crescent Societies, told Reuters. At the time of this writing, the death toll from the storm has surpassed 500 people. Mozambique President Filipe Nyusi believes that as many as 1,000 people may have died in his country alone. Denialism continues on a state level, as lawmakers from many states are actively working to cut back on education about climate disruption. Even worse, a new wave of bills across many states could actively allow teachers to teach climate denialist propaganda, as well as undermine the teaching of science in general. Broadcast TV networks’ coverage of climate disruption has fallen to a dismal new low. Nearly 60 former security officials penned a letter to President Donald Trump objecting to his administrations’ plans to counter the governments own findings about the threats climate disruption poses. The former generals, admirals and other national security officials are concerned by the White House plan that aims to directly dispute and undermine judgments by intelligence agencies and the military that underscore the threats posed by climate disruption. However, scientists and activists continue to sound the reality alarm. A recent report showed that the extraction of resources, globally, is responsible for half of the carbon emissions on the planet. These activities are also the cause of the loss of 80 percent of the Earth’s biodiversity. The report also showed that resources from the planet are being extracted at a rate three times as fast as they were in 1970. Again, children are proving to be perhaps our greatest hope in the struggle for dramatic policy change in response to the climate crisis. On March 15, more than 1.4 million students around the world took part in school strikes aimed at generating action by adults. Children walked out of schools in 2,233 cities across 128 countries, and further strikes are planned for April 12. It is a good time to remember that in many Indigenous cultures, tribes use the literal dreams of their children as a factor in guiding their decision-making. If people and governments won’t listen to their consciences regarding how to respond the crisis that is upon us, perhaps they will listen to the children. Extreme weather is blowback from energy systems that were designed and operated in ways that entrenched inequalities.